This beautiful poster features top women jazz and big band musicians (and three men who championed them). It’s famed predecessor, the Art Kane photo Harlem 1958, was the inspiration behind this photo shoot. Great idea. Would love to see a brief bio on each of these talented musicians, to help raise awareness. We are working on a timeline which we will post as soon as it’s available. Truely inspirational to all students of jazz. What a tribute and masterful job of organizing. Noting with regret the absence of one contemporary keyboard giant, Lynne Arriale. Where can I purchase a copy of this lovely photograph? Yay, Marian McPartland. She was in the Art Kane original in 1958, and here we see her again, 50 years later. Gone now, but fondly remember. R.I.P. Any plans for an 8×10 of the Harlem 2008 picture? This is a marvelous addition to the American History that is the music that is called JAZZ! Wonderful!! 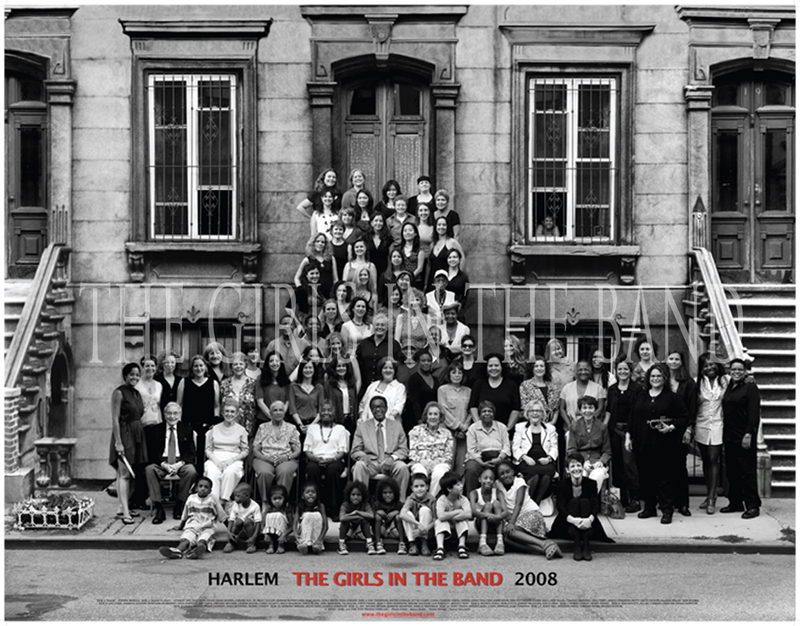 2 Pings/Trackbacks for "The Girls in the Band Harlem 2008 Poster"